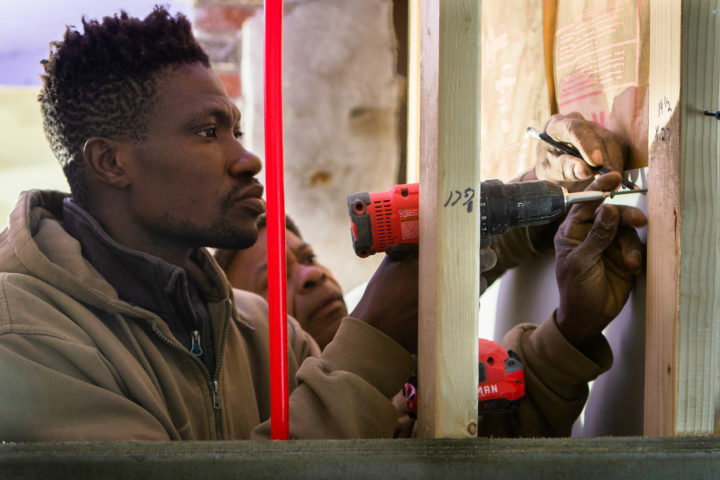 Orson Horchler (left) of Bondeko carpentry works with Namory Keita on a renovation project in Cape Elizabeth last week. Horchler hires mainly immigrants and said someone has called the police both times one of his African-born workers has arrived at a job site before him. Keita is originally from Guinea, in west Africa. 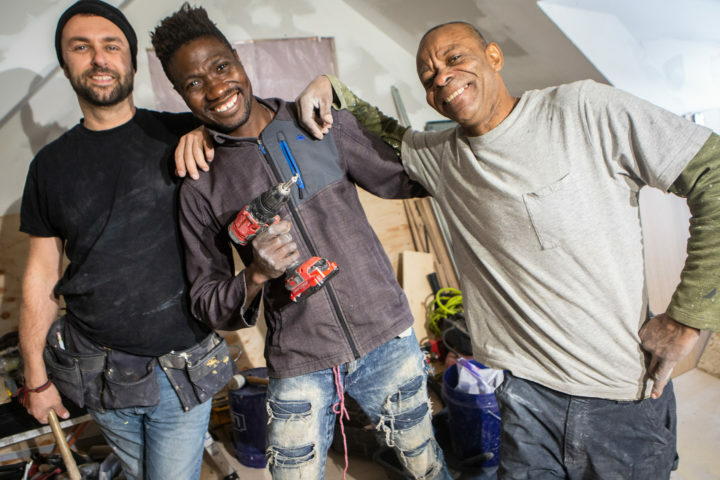 Only twice in three years has one of Orson Horchler’s black, African-born carpenters arrived at a job site before him. Both times, someone’s called the police. The first time was in Scarborough. The latest incident happened in Westbrook on March 7. Horchler, who operates Bondeko carpentry, only hires new Mainers to help with his construction and remodeling jobs. He remembers his own difficult immigrant experience, coming from the Paris suburbs 20 years ago. He wants to give other immigrants the help he never got. But incidents like these make him want to quit and leave Maine for good. 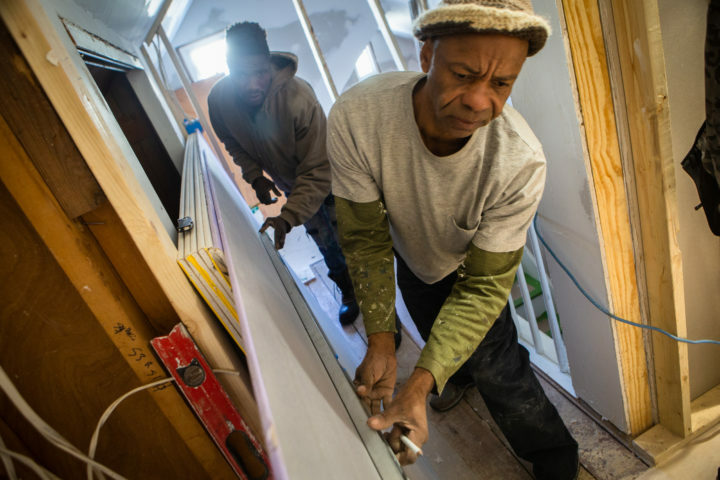 Namory Keita (left) hangs drywall with Alban Bowen while working on a bathroom renovation in Cape Elizabeth last week. Keita is originally from a famous family of drummers in the west African nation of Guinea. Now, he calls Portland home. Namory Keita is from the west African nation of Guinea. Keita has been in Maine for five years. Coming from a family of well-known musicians, he makes most of his living drumming and teaching. In between gigs, he works for Horchler. That day in Westbrook, he arrived on time at 8 a.m. at the work site on Haskell Street. While waiting for Horchler — who texted saying he was running 15 minutes behind — Keita chatted on the phone. “I was talking to my brother in Japan,” said Keita. It’s rare for Horchler’s carpenters to get to work before him. Most don’t have cars and he picks them up in the morning in his large, four-door work truck. After waiting about 10 minutes, Kaeita saw a police car pull up behind him, lights flashing. Two officers got out and approached his car from either side. He said one of the officers asked what he was doing there. He told them he was a carpenter, waiting to go to work in a nearby house. He said they asked to see his tools. He explained he only had drums in his car because Horchler had all the tools in his truck. Then, he said the officers went inside the house and asked an electrician inside if he knew Keita. The electrician did not. About that time, Horchler drove up. He parked and got out of his truck. Horchler, who is white, smoothed things over, vouching for Keita. 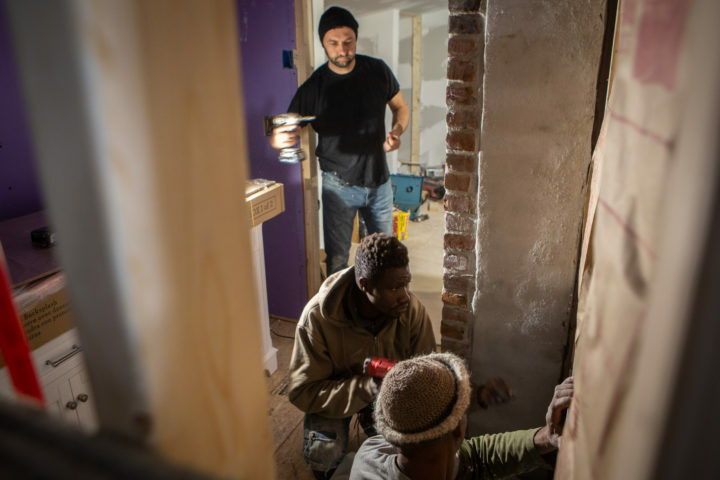 Orson Horchler (left) of Bondeko carpentry cuts a two-by-four while Alban Bowen (center) and Namory Keita hang drywall on a renovation project in Cape Elizabeth last week. Horchler, who grew up outside Paris, France, believes in hiring new Mainers who may, or may not, speak English. Operations Division Capt. Sean Lally of the Westbrook Police Department said he has no knowledge of what the officer told Horchler that day. Looking up the dispatch notes for that particular call, Lally said a parent phoned because Keita was “circling the block, staring at kids” waiting for the bus. “He was probably just looking for the address,” said Lally. The Westbrook Police Department responds to more than 30,000 calls for service a year, said Lally. Most turn out to be nothing and it’s often hard to say what people’s motivations are for calling the police. But it’s not unheard of for someone to call 911 when they are scared — justified or not — and the police are duty-bound to respond. Lally is the son of immigrants himself. Both his parents are from Galway, Ireland, and he said he sympathizes with the struggles of immigrants like Keita. Orson Horchler of Bondeko carpentry brinsg another screw gun to Namory Keita (center) and Alban Bowen while the three work on on a renovation project in Cape Elizabeth last week. Horchler hires mainly immigrants and said someone has called the police both times one of his African-born workers has arrived at a job site before him. He chalks it up to racism. Keita said he wasn’t angry, or scared that day. It’s not the first time police have given Keita a closer look. He said he was once pulled over in New Hampshire for having a headlight out. But when he got home, his headlight was just fine. More than once, police have been called to check out noise complaints around his daytime drumming classes, even though Portland’s noise ordinance doesn’t kick in until late at night. As a black man, Keita said, he’s very sensitive to issues of race here, but still harbors no resentment. He thinks it’s just based on fear which, right or wrong, everyone experiences. 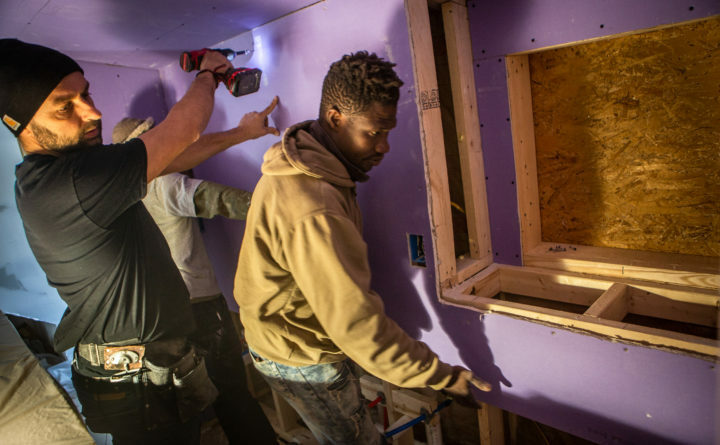 Alban Bowens (right) and Namory Keita cut a piece of drywall while working on a renovation project in Cape Elizabeth last week. 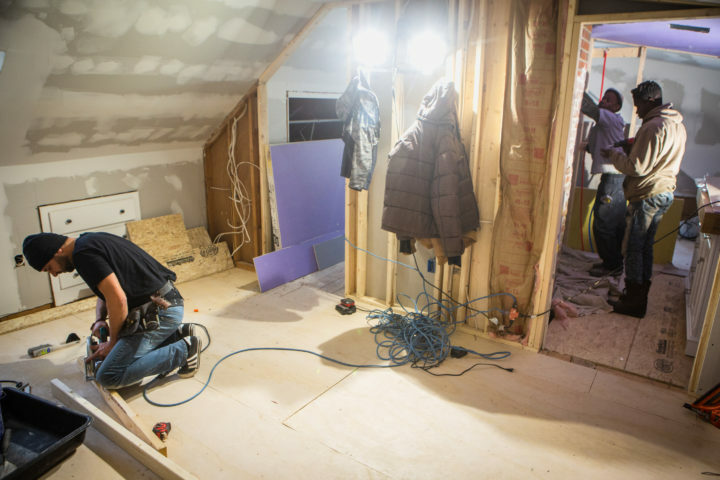 The pair work for Bondeko, a carpentry company that specializes in hiring new Mainers. Keita is originally from Guinea in west Africa and Bowens comes from Saint Vincent and the Grenadines, an island nation in the Caribbean Sea. Horchler is not as circumspect. He grew up an hour outside Paris, France, and moved to eastern Maine when he was 18. He said he knows what it’s like to be a newcomer with limited knowledge of local customs, language and culture. He said he was assaulted in a quarry in Frankfort after 9/11 because he was seen as a foreigner. Orson Horchler (left) and his Bondeko carpentry crew of Alban Bowen (right) and Namory Keita goof for a photo at a job in Cape Elizabeth last week. Horchler grew up outside of Paris, France, Bowen is from the island nation of Saint Vincent and the Grenadines and Keita is from Guinea in west Africa. On one hand, incidents like the one in Westbrook make Horchler want to leave Maine. On another, it makes him want to try harder. “It’s not easy, running a business, having this kind of thing happen but I really want to keep going,” said Horchler. Where other carpentry companies have trouble finding workers, said Horchler, he has more than enough because he’s not afraid to hire people who don’t speak English. He’s had other carpentry firms contact him asking if he knows any immigrants they could hire. He happily gives them names, but usually when they find out the person doesn’t speak English, they balk. On his jobs Horchler will often have a crew with no languages in common. But they understand the international language of construction. They draw pictures, they do charades. They make it work and they have fun doing it. “I want to give opportunities. There’s so many skilled people, or people who can think with their hands and learn the trade,” said Horchler. Horchler said it’s about going further than multiculturalism, where two or more cultures coexist, beside each other. It’s about interculturalism where they mix and interact.